The Nissan Leaf, the world's best selling electric car, charging up. An improved version, made in Sunderland, has become available from April 2013. RobotCar UK has been working with the Leaf since September 2012. Carlos Ghosn, CEO of Nissan and Renault is reported as saying of driverless cars: "I dont see any impossible obstacle. I think this is something you are going to see on the horizon of 2020 because the technologies are getting mature." (See also entry for 21 July 2013). Sergey Brin said in 2012: "You can count on one hand the number of years until ordinary people can experience this." 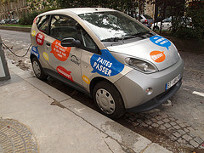 If one's definition of what is disruptive technology requires it to initially be cheaper for a mass market to use than the already available traditional technologies then in the passenger car segment only the Autolib' Bluecar scheme run by Bolloré in Paris using relatively lightweight cars purpose-designed by Pininfarina is near to it in the electric car/driverless car space. An early indication of the technologies that may be found in future driverless cars can be seen in this BMW/Sunday Times video released on 17 June 2013. For 2013 and beyond Worldreviews will be following driverless and robot car issues. (Press releases can be sent to editor@worldreviews.com). Here at Worldreviews we try to bring you news of what is going on in the driverless car world if not quite in real time then as soon as anyone else does. (Links in the text are to videos). As 2013 has progressed a great deal has advanced in the world of driverless cars and more manufacturers have been willing to give an insight into what they are working on. We hope to have played a small part in being a catalyst towards this. At the beginning of 2013 Google had the only cars that members of the public might have known were driverless and next to nothing was known about the business models that would bring them to market. By late 2013 Google driverless cars had covered 500,000 miles without robotics-caused accident. It is about time in the U.K. we simply got hold of the technology we might need even if we did not invent it. The Google driverless car or some other iteration of it would be a good bet. Countless benefits would derive. Teenagers without a driver's license or unable to afford insurance could use them and parents would be happier if they did. The principal handicap of old age is reduced mobility. With driverless cars so many people could remain economically productive for so much longer. Childcare could be made so much easier if grandparents could reach the grandchildren in a driverless car and take them out for a ride. Getting to airports would be far easier as the car could return home of its own accord. A compact country like Britain would be ideal for the driverless car. There is plenty of street furniture and mobile telephone masts to house the sensors and communications equipment not onboard. As network connectivity would be the key to mobility [for some iterations] these cars could come with a network contract much as mobile telephones do. This would mean that little public finance would be needed as private capital could finance everything on similar models to telephony. The early rollout would probably have to be within limited zones e.g. the London congestion charge zone (where vehicles rarely move at more than 20mph anyway), or within the M25, or in a small town but this was the case with mobile telephony rollout. The onboard sensors would have to cope with every type of conceivable hazard from bulldozers reversing out of building sites to cats with nine lives but a small amount of driver input might be permissible along the lines of the fairground bumper car. In principle, though, robotics should take over. There is no risk that real drivers will have to evacuate the roadspace entirely. Delivery vans, emergency vehicles and articulated lorries need drivers for the foreseeable future. There will be teething troubles. When the Docklands Light Railway was being built a driverless train with no passengers onboard hit the end bumpers at Tower Hill with the result that the front carriage ended up dangling over the edge of the elevated railway but the incident was not repeated and driverless trains have operated safely on the DLR ever since. [Link (22 January 2013) to a Google driverless car video]. [Links (19 February 2013 onwards) to RobotCar UK videos]. Continuing the discussion of driverless cars, today's Reuters report Insight: Electric cars head toward another dead end suggests purely electric cars are struggling to get consumer acceptance whilst hybrids are not. This is not too surprising. If you are going to own the car yourself you do not want the battery to die after three or four years just at the point when a second owner (who will usually have less means for replacement parts than the first owner and is more likely to want to own it outright and not lease a battery) may be about to take it off your hands. If you are going to drive it yourself you are not going to want the compromised performance of most electric cars either. So the near future for the electric car looks like it could be the driverless car. Performance matters less. Finance models that encourage car sharing are more likely. If you look at the Google driverless car video it looks like the car is powered only by the electric motor with the petrol engine removed to accommodate the electronics. 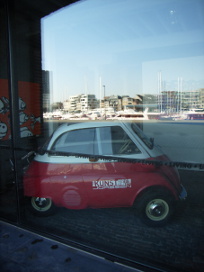 Travelling about a dozen up in a Citroen DS - two adults and the rest children, of which I was one - down a foothill of Mont Blanc to get to a mountain railway station on time was probably the most memorable car journey I have done but travelling in an Isetta bubble car was another early memorable experience. Electric cars are not disruptive technology but driverless electric cars will be when they arrive. A disruptive technology is almost always cheaper than the technology it displaces, often by a big margin, but does not have to perform as well. It should, though, make it through to new classes of customer previously unreached and win them over easily. A strong, lightweight driverless car that can travel at urban speeds with total costs less than those of a supermini would be immensely attractive. So my aesthetic vision of what a driverless car will look like is closer to the Isetta bubble car than the Nissan Leaf, closer to the Toyota i-Road than the Toyota Prius. The early driverless car for sale or hire can dispense with the front engine compartment and give itself a strong rounded external shell. It does not need much more than two seats or a bench seat and a vestigial boot. Driver controls need not be much more than in a bumper car and these mainly for intervention in unpredictable situations not for continuous use. Simplicity will keep costs and weight down. Where the spare money needs to go is into F1 style structural integrity and superior crash survivability. Roadside sensors will tell the car what types of vehicle have passed ahead, their speed, the likely colour of the traffic lights as the car is scheduled to reach them and help automate separation distances when the line of traffic is mainly driverless cars. The luxury version could doubtless be like Cinderella's pumpkin, tall enough to accommodate the gown wearer and the hat wearer, with the strong external rounded ribs of the pumpkin and the ability to disappear of its own accord at midnight or, if that is too familiar in London, go south of the river. Driverless cars would make new town planning easier. Much of the cost of any newly built home is land value. With so many houses and flats having to have dedicated parking spaces, garages, front drives and turning spaces a new town could be more land efficient by doing away with many of these. The saving in land costs would pay for the driverless cars and the roadside electronic infrastructure to assist them. However, the town would be kept low rise to avoid high density. Instead of loading up a conventional car in the drive, you would summon the driverless car like a taxi from the pound to the kerbside. It would arrive assisted by the roadside electronics and network connection. Once no longer required, if within the town, it would return to the pound of its own accord. Conventional cars would still be used but resident owners would be encouraged to park them at safe, edge-of-town locations. 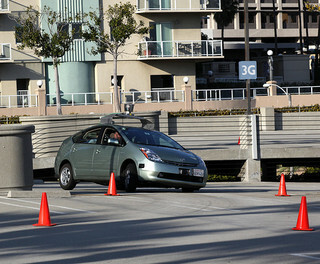 From there they could park-and-ride home by driverless car. With traffic streamed by electronic command within the town, main thoroughfares could be narrower. Emergency vehicles could instruct driverless cars well ahead of them to pull to one side where possible and instruct traffic lights to allow those still on the road to pass through. Some cars in the pound would be individually owned. Others would be rented, returning to the pound for a quick spruce up before being sent out to the next user. When a white van blocks the road, the driverless cars could co-ordinate their horns automatically to sound a peal of protest. Air quality in rural areas is by no means necessarily good. Some fairly heavy duty chemicals are used on crops and these can carry in the wind as particles or aerosol to nearby settlements as can bacteria and odours from manure. Even a continual battering by wind borne soil particles can be undesirable. If the usual main air pollutants generated in urban areas - diesel particulates, nitrogen oxides, carbon monoxide and ozone - can largely be eliminated, air quality could potentially be better than in many rural locations. This is a reason why electric driverless cars are so appealing. They will contribute to extending lifespan through improved air quality, give enhanced mobility to more people, reduce the amount of development land needed, change the shape of vehicles, reduce accidents, redirect driving time to other or simultaneous uses, obviate the need for traffic wardens and reach new consumers groups in the way that disruptive and transformative technologies do. It is not yet 1st April but here is a car that runs on air and water. Conventional zinc air batteries suffer damage to the anode from CO2 in the air reacting with the electrolyte during charging and recharging but the aluminium anodes used in this car are diagramatically shown to reject the CO2. The real consumable here seems to be the aluminium sheet anodes. Carrying around a bulky-shaped extra 25kg to, in effect, extend range when needed is a big design downside but either where electricity is in short supply (rarely) or when there is no time to recharge (quite often) but there is plenty of water around (usually), a case could be made for a back up battery or cell of this type, perhaps of lesser size and weight. It does not sound as if the aluminium battery alone can deliver the horsepower to drive the car if the lithium ion battery has run out of charge. The estimates given at motor industry fora that driverless cars will not be around until 2020 or 2025 are clearly pushing the date too far into the future to suit conventional vehicle producers or to goldplate the product. The driverless car needs a little helping hand in the form of a near riskless environment in which to operate. The next small new town somewhere should install the guidance hardware on the streets to make the cars' task easier. Then the physical structure of the whole town should be mapped into the cars' memory in advance, making the learning tasks of each individual car that much easier. 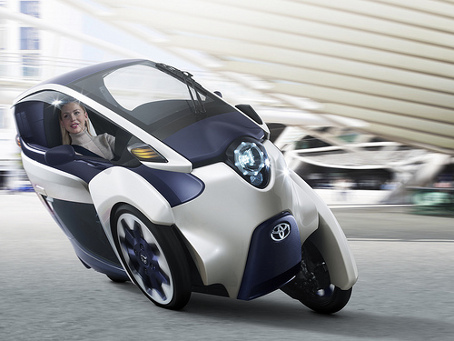 Then a lightweight design like the Toyota iRoad (which looks much like a 21st century bubble car), modified to be a driverless car, should be adopted as the sole first generation vehicle type for individual and family use within the town's precincts, beyond which the cars would not be permitted to travel. The legal framework of a new town development corporation could contain provisions for the cars' operation and provide for non-license holders to 'drive' the cars. After all non-riders were able to drive the first horseless carriages. Then the experiment could begin. It could be a bundle of fun and soon lead to a more pluralistic framework. Volvo's ideas for crash- proof cars and platooning, building on the Satre programme and Ricardo know-how, are a half-way house to driverless cars and are likely to be here by 2020, if not before. Governments will have to step up their act to provide a friendly legal and liability framework to receive fully driverless cars. In Britain we cannot afford to be behind. Google's 60 million fund to help French media publishers upgrade for the new media era is all a little dull from the British point of view. Surely we've done this already? What we need is a head start in setting up a driverless car village. Get in touch as they say: there would be plenty of advantages for Google. At the moment a lot can be sold on the basis of safety. I disagree with Forbes' Chunka Mui that the disruptive nature of driverless car technology will mean less spent on safety features. There is some evidence that as technologies get safer we spend more on safety features - aeroplanes, nuclear power and automobiles serve to demonstrate the point. Where we are not in control we expect greater safety and driverless cars will be no exception. Train and coach travel are safer than travel in individual cars, in the case of trains by a significant multiple, but we expect them to be. Being in individual control cancels out some demands for safety. I listened to two coach drivers discussing whether they would like to be train drivers. They agreed with one another that they would not on the basis that if a train crashed they could do nothing about it. This despite the fact that it would be less likely that a train would crash. So it will be with driverless cars. If the engine cuts and a lorry shunts the car you will want it to bounce off the motorway in one piece and with the occupants uncrushed simply because they themselves cannot take avoiding action. In the long transition period before, say, 90% of vehicles are driverless, the hazard to driverless cars from driven vehicles will not be minor and so they will have to have superior passive safety features. The combination of automation and enhanced passive safety could make them as safe as trains and aeroplanes for their occupants. In a town or village set up exclusively for driverless cars they could be safer still but the need to admit plurality (of vehicles, e.g. manned fire engines, vintage cars, towed boats) trumps uniformity beyond an exploratory phase. There is not much doubt that driverless vehicles will impact on building design. Tuck an internal combustion vehicle into a garage under or in a house and you have to do your best to isolate combustion fumes from the rest of the house - sometimes easier said than done. Good air quality equates with extended lifespan. Benzene is no longer used in fuel but you do not want chemicals like it lingering in buildings. Driverless vehicles are going to be electric, with no fumes, and if lighter and more compact more able to share living space with you. Want the car to come into the conservatory that has replaced the garage? No problem. Press to slide a six foot wide door up and let it drive in. Prefer to sit in the passenger seat? No problem if the dog can press a few buttons. We have to see this in a real driverless car! Will the artificial intelligence in driverless cars approach consciousness? No. Will non-human driving use consciousness? Ask Fido. It is hard to say whether an innovation will ultimately increase employment or not but driverless cars is probably one that will. Motor cars did because though they diminished employment for those driving horse drawn vehicles they extended opportunity and mobility to new demographics. Driverless cars will, too, and so increase the global number of hours worked in any society. Imagine you have a skill mending shoes but cannot afford premises or the costs of staffing them to adhere to regular shop hours. With a driverless car you can visit your customers, pick up the shoes and discuss the requirements, repair them in your garden shed and return by car, with the car taking the most efficient route to allow you to pay return visits to all your customers, with them having notified you perhaps by 'app' that they or someone else is back home so that abortive delivery visits when no one is there become a rarity. Of course, such personalised service might have been theoretically possible using a horse and cart, conventional car or scooter but the economics have been against it and the custom of providing it has not developed. Driverless cars will allow such custom to develop. Seventy years old and know how to repair shoes or a student who learnt to repair shoes in your gap year and both in need of earning some money in hours that suit you? Get on and do it. Of course, the skill in demand might not be shoe repair but much of the complicated panoply surrounding employment can be dispensed with. If you need someone for something, find them on the internet, invite them to drive round, conduct your own form of interview and if you are satisfied, engage them for the task. A disruptive technology like driverless cars will undoubtedly demolish some business models and allow new ones to flourish. So the internet has destroyed the classic travel agent business model but boosted the 'last minute' reservation business model but not in any way that creates an oligopoly. Wish to see the pandas in Edinburgh zoo? Get in the car and it will take you there overnight and bring you back the following night. On the face of it the hotel business loses out but I doubt it for now. Google cars and Robot Car UK are driverless cars where the driver can intervene and are not fully autonomous vehicles (as some of the new London Tube trains are going to be, one might argue). There has been no information released as to whether they are well optimised for night travel. (Infrared sensors would greatly assist night travel). This is a reason why some of those running a slide rule over the economic benefits may be overestimating them. A business model that embeds some guidance beacons roadside might be an early winner and for that a well-designed village might be a good testbed. Even if the vehicles of the future are not to be fully autonomous it is essential, for the full economic benefits of the model to be delivered, that the driver never has to intervene. The 'blind man' should not be expected to see. He should be able to ditch the internal combustion engine, too. Standardization is going to have to play a part, a substantial part, in the technology of driverless cars. Even what we call them is important. For now, driverless cars is probably the best term to use for what is the desirable consumer product. Google cars are referred to as 'self-driving cars', which is probably the best term to use in formal research papers (though when you enter it in a search engine you get offers for self-drive hire vehicles which you do not get with the term 'driverless cars'). An autonomous vehicle, though, could be something driven or piloted remotely - like a vehicular moon probe or a digger vehicle in a quarry with no humans onboard (and clearly not a car). It could also be a driverless car able to return to a pound after use, using its sensors, guidance and communications systems without commands from anyone. 'Autonomous' also has connotations of 'scary' at present so perhaps it is a word that should not be applied without consideration to the cars. Venture capitalist Tim Draper, in an address to Stanford University Venture Program in February 2013, called them 'self-navigating electric cars' which is getting close to what they should be with the big proviso that one of the few things that the driver should have to do is enter navigating instructions as to destination, stop off points and so on which is what distinguishes him from the dog sitting in his seat. After a while he may have to stop being called the driver if 'driverless car' is to be the term. What he should not have to do is to sit behind the wheel and be forever alert so as to intervene in an emergency or for other reasons. He could not then be the now proverbial 'blind man' which would defeat the object of a driverless car. Current Tesla cars run to a different business model; they are electric cars creating for the driving pleasure of the driver, amongst other things, and have marginal aspects of self-navigation. No-Automation (Level 0): The driver is in complete and sole control of the primary vehicle controls  brake, steering, throttle, and motive power  at all times. For the purposes of a driverless car one would hope to see the Google cars and other iterations reach Level 4 but not yet go beyond, on public highways especially, to become autonomous vehicles which would go somewhere without destination or navigation input from the driver (or occupant). This would mean a 'taxi pound' could not remotely recall the vehicle. If it were to return under its own power, the hiring passenger would have to command its return. (There is more than one obvious point in this: the car at the very least could not be allowed to return with the shopping still onboard). This also highlights a reason why the internal combustion engine will eventually have to be dished much as it provides enjoyment in driven vehicles. You might tolerate electric powered cars returning to a pound alone but not internal combustion ones leaking sump oil or radiator coolant. Such defects would constitute a disaster in an unoccupied vehicle in a way they do not to the same extent in an occupied one. As has been in effect already suggested, one of the best ways to test the full range of parameters is in a town or village designed to take on the driverless car experiment. Ford has now released video of a robotically-driven white Transit van. It does not appear able to mount the kerb in white van man style, though - or cut people up either, one presumes. Is this a Level 4 vehicle or not? Is it autonomous or is it rigorously controlled within a safe environment? The problems of classification mount. [Just as 'Bedford' was for a long time shorthand for a lorry in Africa and 'Mini' shorthand for a small car, as later transformed into 'supermini', so 'Transit' is still shorthand for a van in Britain and the vehicle holds a place in Britons' affections]. In April Carlos Ghosn told Stanford University that cars would become safer, that their dependance on oil was unsustainable and that there would be more autonomous driving. A route to safer cars would be eliminating human error. There would be more diversity in motive power to encompass gasoline, electric, hybrid, plug-in hybrids and fuel cells. Electric cars were now proper cars in all respects. Price had come down so that a Leaf could be bought for about $21,000. Range anxiety was because of a lack of proper infrastructure. Tax incentives and regulation would play an important part in the adoption of electric motive power as it was in governments' interest to substitute oil imports. He cited the example of 60% use of diesel power for cars in Europe compared with 1% in the United States and Japan as a result of tax incentives. He said that the Mayor of London was negotiating with them [Nissan] for taxis which would go downtown with zero emissions. He said that time spent in the car commuting was currently largely unproductive and autonomous driving would rectify this. He said he had been told by experts that a baby born today had an over 50% chance of living to over a hundred. If you cannot drive over eighty you have a problem for your remaining 20 years. You cannot be allowed to lose your independence. So a marketing opportunity presented itself to the car industry. He was not ready to see a car entirely without a driver. A car would be more like a partner. Autonomous driving would relieve the driver from tasks. The latest Mercedes driverless car demonstration is impressive for what it might imply. Of course the route will have been surveyed both physically and technically many times over to avoid mishaps but here we have a luxury car, the latest S500 with a hybrid V6 engine, with no obtrusive sensor protrusions, driving an historic route on an autonomous basis. In an S-Class the person in the back seat is often the most important person and the person driving is the chauffeur (or driver if you prefer plain English) but what is implicitly being said is that the car can become the chauffeur and look after the passengers in good measure in a car that does not sacrifice traditional luxury car features and is discreetly visually the same. This is an interesting response to disruptive technology cars anticipated from Tesla (when it gets round to producing a driverless car - an electric car alone is not disruptive) that seek to compete in the premium or luxury space, optimise a different form of motive power and perhaps look different. It will democratise the chauffeur benefits, too, as the technology filters down for more widespread use. Taking the car away and parking it somewhere nearby after use is one of them although neither the short or the long video show this. A S500 hybrid has a petrol V6 turbo combined with an electric motor. The batteries can be topped up with external power. Theoretically the vehicle can deliver 94mpg but that would not be the case with all the sensors onboard. If your garage has solar panels on it and you live somewhere hot, it might even cost nothing in fuel costs to be driven about. * All critical information is generated onboard making it largely safe from hacking. * Wireless information is not being received. (In this it must differ from a Google car). This does not mean that in future wireless communications with other vehicles and traffic management systems will be excluded. * There is a capacity for wireless outward communication as there is a SOS button which can be pressed in case of electric shock, heart attack or the driver feeling unwell which halts the car and alerts an emergency centre. This SOS button is instructive because there is no reason why there cannot be more than one, located to be within reach of all passengers. A 'blind man' could press one sitting somewhere other than the usual place for the driver and this could mean that the traditional steering wheel and pedals could be replaced by emergency joysticks or controls within reach of all passengers. This would allow the car alone to act as the chauffeur. Here at Worldreviews we try to bring you news of what is going on in the driverless car world if not quite in real time then as soon as anyone else does. Today Volvo released these two consecutive videos on an AOL channel. The first one is the first real advertisement for driverless vehicles we have come across. Everybody else's output has been more what one might term promotional. The second one explains what Volvo driverless cars are about and is close to a commitment by the company to put 100 driverless cars on the road in Gothenburg by 2017. We'll be interested in what Volvo does with driverless cars here in the U.K. as we have the second biggest market for the make. There is a business model divide opening up between players that rely on wireless external data acquisition to improve navigation - Volvo and Google for example - and those that are trying to have all critical information for driving generated onboard - like Nissan and Mercedes. These models may converge but videos released to date are an insufficient guide to the if and when. A number of the questions we have broached over the year - night navigation, coping with animals on the road, vehicles communicating with infrastructure, emergency vehicles commanding other vehicles to pull over and autonomous parking - are expressly addressed in this Volvo video.